gaming. Though I do want to mention a couple of issues unrelated to gaming that made headlines. Starting with the idiot with real weapons and an issue with the Green Power Ranger. Said idiot, after boasting on Facebook about his clever plan, promptly spent some quality time on the floor of the convention center with several Phoenix police department guys standing on top of him. Once the metaphorical smoke cleared, Comicon banned all prop weapons and instituted bag checks and metal detectors at the doors. It was not TSA-grade security, but rather the same level as a concert. This instantly created lengthy lines around the convention center in the blazing sun. I planned to go Friday morning but after the long lines on the news and a torn calf muscle (exercise is good for you!) I put off my trip until Saturday. Also starting Friday, the vendors had to cover up all the weapon-like stuff they sold to avoid violating the “no weapons” rule. Which created the next tempest in a teapot, Ultrasabers ejection/departure from the vendor hall. I have no insight as to what happened, but other media reports that the security requirements created friction between PHXCC and Ultrasabers. 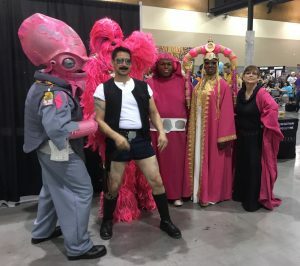 Ultrasabers wound up leaving the convention. Both sides blame the other and good luck to anyone that can figure out what actually happened. Still, it was the talk of the convention. 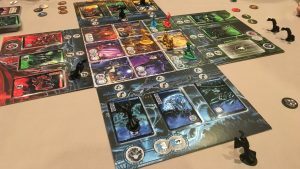 I finally hopped in (on one good leg) Saturday morning to the Phoenix Comicon 2017 Hyatt gaming area. Jim from the Crit Hit game convention organized the independent gaming area. Running for Crit Hit meant I got a badge which I picked up in the gaming area. Haaldaar, Werlen and I planned a three-table run of “Assault on Singularity Base” battle interactive for the Cypher System. It is a hoot to run with each table working towards one part of a multi-pronged assault. Between the security issues and a somewhat obscure location (in the lobby across from the bagel shop), I only ran a single table due to a lack of players. Many battles ensued and the players had a great time. I finished around 2:00 PM and went upstairs to the Hyatt atrium. 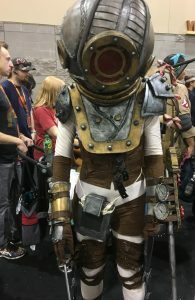 The atrium had gamers and games to play at Phoenix Comicon 2017, but attendance was better in previous years. Security concerns and the long lines on the evening news were possible deterrents. Werlen and I jumped into a game of “Ghost Stories” and managed to lose…badly. The evil Chinese ghosts and hopping vampires overran the village. Sorry peasantry, we did our best. After failing miserably, we decided to hit the vendor area. We had the wherewithal to drop our bags with the bellman at the Hyatt (a very well spent $2.00) and skip the bag check at the convention center. Saved a great deal of time. The vendor area had many, costly options to spend my hard earned dollars, but a couple did pop out at me. 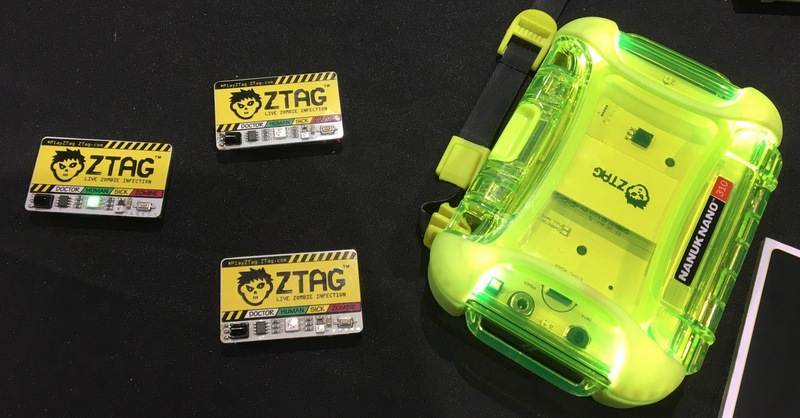 Ztag ran an interesting scavenger hunt game with small digital badges and infra-red emitters. You get close to other people and they become infected and join the zombie horde or you can gather enough checkpoints and become a doctor to cure the sick. I could not play due to injury, but it would be fun if I could walk faster than a 90-year-old man. Here is a shot of the badges and a checkpoint. 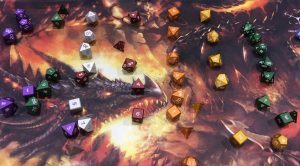 Gravity Dice had some amazing dice on display and I bought a set. A full review will follow in the near future. 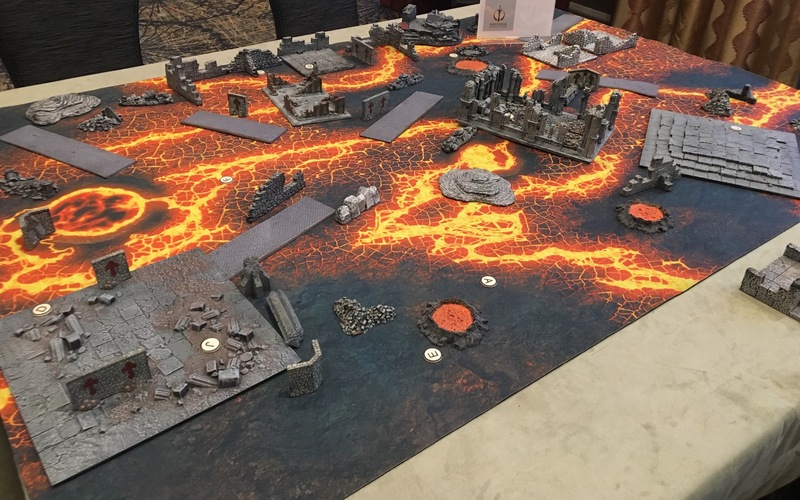 Imperial Outpost Games operated a separate room with an eclectic list of games, including Cestus, which had a nice miniature combat table. 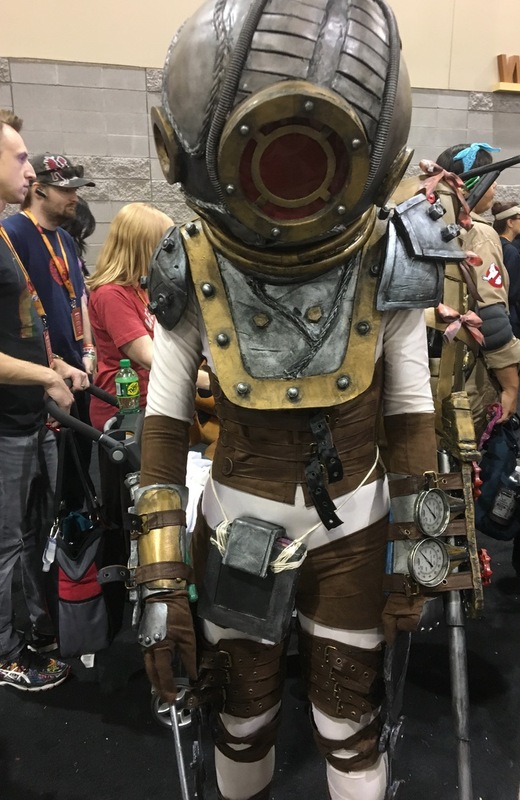 Normally I do not cover cosplay on a gaming website, but this was just amazing. And this group, which I present without comment. It pretty much speaks for itself. Not really sure what it is saying, but it does speak for itself. 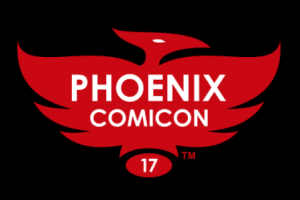 Overall, the Phoenix Comicon 2017 ran well, even with the security issues. I look forward to attending next year. July 6, 2013 trask Comments Off on My Childhood Toys are Museum Pieces!